Nearly 120 years ago, German township wasn’t quite so wild as the Wild West, but it wasn’t so mild, either. One notorious figure was John Swoverland, who would start fights and threaten honest citizens whenever the mood took him… until someone got the better of him: Samuel Stewart (misidentified here as “William”). There were several accounts of the fight in various newspapers. 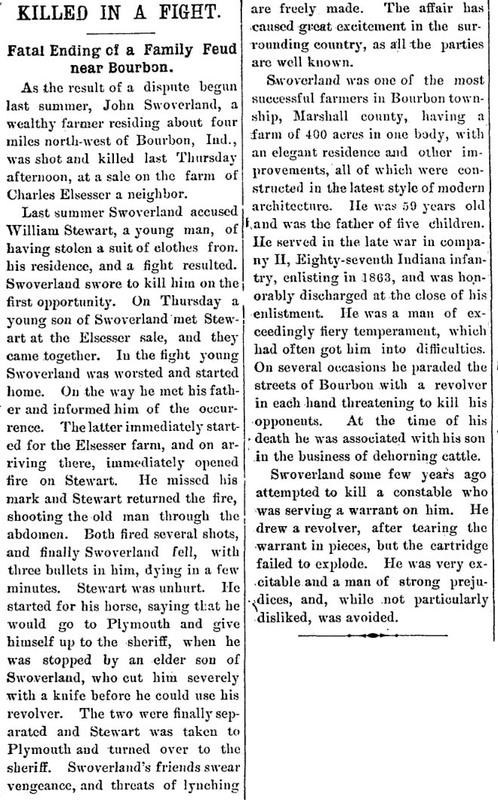 In the Bremen Enquirer, it was claimed that Stewart proceeded to try to kill Bremen constable James Sheets but had run out of bullets. (However, this was not part of the story in other newspapers, and Sheets apparently did not testify to this at the trial.) Regardless, Stewart turned himself in to the county sheriff and, after the trial ended in a hung jury, he was released and never retried. Although this writer could find no Swoverlands in the Bremen area, John Swoverland’s brother Peter has direct descendants in the area that include Stuntzes.